You can now download your copy of the Summer Newsletter, bringing you up to date with our doings, and of relevant developments from further afield. We hope you enjoy your read. 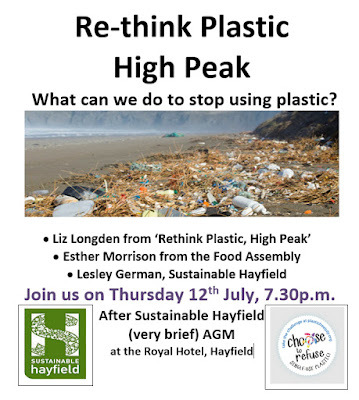 As you'd expect, we profile our own (very brief) AGM and talks on combatting the scourge of plastic, taking place TONIGHT at The Royal, from 7.30p.m.. And we hope we might see you there! But more widely, we hope you'll find there is material of interest to you in the newsletter's pages. Thursday, 12th July, 7.30p.m., The Royal Hotel, Hayfield, for Sustainable Hayfield's 20 minute AGM followed by presentations and discussion around what we can do to reduce our use of that damned plastic. our own Lesley German talking about Terracycle in Hayfield. There'll be chance to find out about the Plastic Free July initiative and we'll end with an inspirational message from David Attenborough, no less, on the response received to the Blue Planet series and its messages about plastic waste. It will all happen in a convivial atmosphere (no walk outs or red cards anticipated), in some contrast to events elsewhere. We hope you can and will join us. We look forward to seeing you!